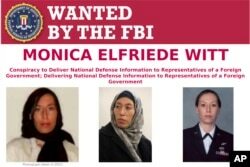 Monica Witt, 39, a former U.S. Air Force officer indicted for aiding Iran, is seen in this FBI photo released in Washington, Feb. 13, 2019. A former U.S. Air Force intelligence officer who defected to Iran nearly six years ago has been indicted for allegedly passing classified military information to the Iranian government and helping Iran target her former co-workers, the Justice Department announced on Wednesday. Monica Elfriede Witt, 39, allegedly disclosed to Iranian intelligence services the existence of a highly classified U.S. military intelligence gathering program and the true identity of a U.S. intelligence agent, according to a federal grand jury indictment unsealed on Wednesday. Witt, who defected to Iran in 2013, is also accused of helping Iranian hackers working for the Islamic Revolutionary Guard Corps (IRGC) target at least eight U.S. intelligence officers who interacted or worked with Witt while she was an Air Force intelligence specialist. An arrest warrant has been issued for Witt, who is believed to be in Iran. The Iranian hackers -- identified in the indictment as Mojtaba Masoumpour, Behzad Mesri, Hossein Parvar and Mohamad Paryar -- face charges of conspiracy, computer intrusions and identity theft in connection with the scheme. John Demers, assistant attorney general for national security, said the case highlights the lengths to which U.S. adversaries will go to identify, expose, target and recruit current and former U.S. intelligence personnel. “Espionage by past or present members of the intelligence community poses a significant threat to our country and a heightened danger to their former colleagues,” Demers told reporters. This image provided by the FBI shows part of the wanted poster for Monica Elfriede Witt. The former U.S. Air Force counterintelligence specialist who defected to Iran despite warnings from the FBI has been charged with revealing classified information to the Tehran government, including the code name and secret mission of a Pentagon program, prosecutors said Feb. 13, 2019. Witt visited Iran twice before her defection in 2013 and was recruited through an Iranian government program that targets former intelligence officers and others who have held security clearances, officials said. “We’ve done a considerable campaign to further synthesize current and former U.S. intelligence community officials that they could be targeted in this manner,” Tabb said. Terry Phillips, a special agent in the Air Force Office of Special Special Investigations, said the Air Force has reviewed security measures in light of the Witt conspiracy and "made adjustments appropriately." Witt, officials said, was an ideologically driven traitor. “In other words, she decided to turn against the United States and shift her loyalties to the government of Iran,” Tabb said. Witt, who was born and raised in Texas, served as an intelligence specialist and criminal investigator for the U.S. Air Force from 1997 to 2008. Trained in Persian in the U.S. Defense Language Institute in Monterey, California, she deployed overseas on secret intelligence missions from 1999 to 2003, according to the indictment. From 2003 to 2008, she was as a criminal investigator and counterintelligence officer in the Air Force Office of Special Investigations. FILE - Members of Iran's Islamic Revolutionary Guard Corps march just outside Tehran during an armed forces parade, Sept. 22, 2011. As a special agent in the Air Force’s intelligence branch, Witt was given to a "Special Access Program" that "housed classified information, including details of ongoing counterintelligence operations, the true names of sources and the identifies of U.S. agents involved in the recruitment of those sources,” according to the indictment. Prosecutors say Witt disclosed the code name and highly classified mission of the secret program to Iranian intelligence after she defected to Tehran in August 2013. Witt’s defection came after she attended two "Hollywoodism" conferences in Tehran in 2012 and 2013 and met an Iranian-American “spotter and recruiter” for Iranian intelligence, according to the indictment. The conferences were organized by New Horizon, an organization that bills itself as an International Institute of Independent Thinkers and Artists. 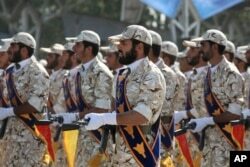 U.S. law enforcement officials say New Horizon is a front for the IRGC's Quds Force and that Iranian intelligence agents use the conferences "to recruit and collect damaging information while propagating anti-Semitism and Holocaust denial." Tabb said FBI agents met with Witt after her first trip to Iran and warned her that she might be targeted by Iranian intelligence. Witt told agents that she would not disclose information about her work if she ever returned to Iran but in the end she “chose not to heed our warning,” Tabb said. Witt returned to Iran the following February for her second “Hollywoodism” conference where she met with members of the IRGC and expressed a desire to defect to Iran, according to the indictment. Iranian agents were initially skeptical of her intentions and dragged their feet in responding to her request, leading her to vent to her Iranian-American: "I just hope I have better luck with Russia at this point," Witt reportedly said. It took Witt nearly six months of traveling through Afghanistan and Tajikistan before she finally defected to Iran, where she was provided with housing and computer equipment and immediately set out to work for Iranian intelligence. According to the indictment, Witt conducted online research and created "target packages" that allowed the Iranian government to identify, track and neutralize U.S. counterintelligence agents. Meanwhile, the U.S. Treasury Department announced sanctions against New Horizon and a second Iran-based entity, Net Peygard Samavat Company, for their roles in the conspiracy. “Treasury is taking action against malicious Iranian cyber actors and covert operations that have targeted Americans at home and overseas as part of our ongoing efforts to counter the Iranian regime’s cyberattacks,” Treasury Secretary Steven Mnuchin said in a statement.